French barrister; born in Colmar, Alsace, 1819; died in Paris Feb. 26, 1905; brother of Marc Sée and Gustave Sée. He was educated in his native town and, on being admitted to the bar, settled there as counselor at law. When, in 1871, France lost Alsace, Sée removed to Paris, where he practised law in the court of appeals. Sée took an active part in Jewish affairs. He was president of the Jewish consistory at Colmar; he financially assisted the rabbinical school there; and he was a member successively of the Jewish consistories of Vesoul and Epinal. Jew. Chron. March 3, 1905, p. 11. French deputy and jurist; born at Colmar, Alsace, March 10, 1847; nephew and son-in-law of Germain Sée. Having studied law at the University of Strasburg, he became counselor at Paris in 1869. In 1870, after the downfall of the empire, he was appointed assistant to the secretary of the interior, resigning in the beginning of 1871. In 1872 he became subprefect of Saint-Denis, but resigned in 1874. Two years later he was elected deputy from Saint-Denis, joining the left wing of the Republicans; he was reelected in 1877, but was defeated in 1881. During the five years of his parliamentary service he took special interest in legislation concerning the education of girls; and measures proposed by him for the government of girls' schools were passed by the Senate in 1880. In 1881 Sée received the title of councilor of state. Sée is the author of "Les Lycées et Collèges de Jeunes Filles," Paris, 1881. French state functionary; born at Colmar, Alsace, Dec. 18, 1850. He graduated from the Free School of Political Science in 1873, and was one of the younger generation who, together with Thiers, Gambetta, Jules Favre, and others, rallied around the leaders of the Liberal party during the empire, and prepared the way for the Third Republic. He served the latter in various offices, namely, as secretary-general of the prefects of the departments of Tarn and Garonne, the Aube, and Upper Marne; subprefect of Toul (1877), Louviers (1880), Boulogne - sur - Mer (1882), and Rennes (1884); prefect of the Orne (1886), Upper Saône (1887), and Haute-Vienne (1891 to 1895). In 1896 he was a member of the extraparliamentary commission for administrative decentralization. Since Sept., 1897, he has filled the post of receiver and collector of taxes at Paris. He is the originator of a plan of cattle insurance in the country districts. Since 1901 Sée has been a member of the central committee of the Alliance Israélite Universelle. He is also an officer of the Legion of Honor. French physician; born at Ribeauvillé (Rappoltsweiler), Alsace, March 16, 1818; died in Paris May 12, 1896. After studying medicine at the Sorbonne, Paris, he graduated in 1846, and established himself as a physician in the French capital. 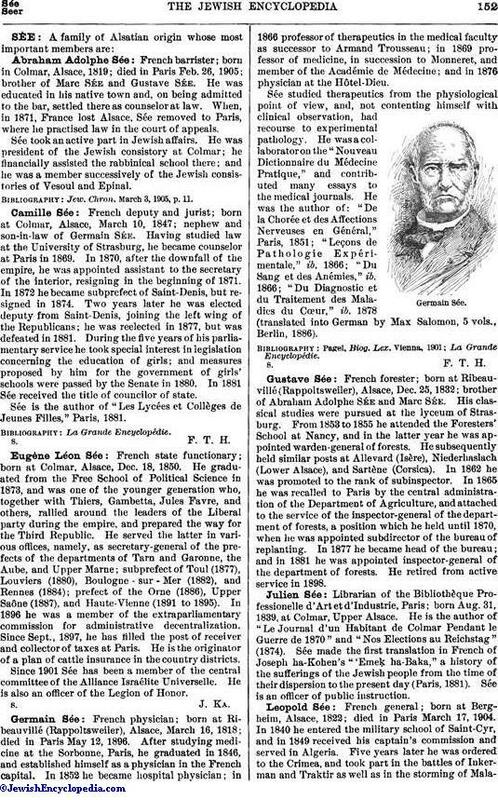 In 1852 he became hospital physician; in 1866 professor of therapeutics in the medical faculty as successor to Armand Trousseau; in 1869 professor of medicine, in succession to Monneret, and member of the Académie de Médecine; and in 1876 physician at the Hôtel-Dieu. Sée studied therapeutics from the physiological point of view, and, not contenting himself with clinical observation, had recourse to experimental pathology. He was a collaborator on the "Nouveau Dictionnaire du Médecine Pratique," and contributed many essays to the medical journals. He was the author of: "De la Chorée et des Affections Nerveuses en Général," Paris, 1851; "Leçons de Pathologie Expérimentale," ib. 1866; "Du Sang et des Anémies," ib. 1866; "Du Diagnostic et du Traitement des Maladies du Cœur," ib. 1878 (translated into German by Max Salomon, 5 vols., Berlin, 1886). French forester; born at Ribeauvillé (Rappoltsweiler), Alsace, Dec. 25, 1832; brother of Abraham Adolphe Sée, and Marc Sée. His classical studies were pursued at the lyceum of Strasburg. From 1853 to 1855 he attended the Foresters' School at Nancy, and in the latter year he was appointed warden-general of forests. He subsequently held similar posts at Allevard (Isère), Niederhaslach (Lower Alsace), and Sartène (Corsica). In 1862 he was promoted to the rank of subinspector. In 1865 he was recalled to Paris by the central administration of the Department of Agriculture, and attached to the service of the inspector-general of the department of forests, a position which he held until 1870, when he was appointed subdirector of the bureau of replanting. In 1877 he became head of the bureau; and in 1881 he was appointed inspector-general of the department of forests. He retired from active service in 1898. Librarian of the Bibliothèque Professionelle d'Art et d'Industrie, Paris; born Aug. 31, 1839, at Colmar, Upper Alsace. He is the author of "Le Journal d'un Habitant de Colmar Pendant le Guerre de 1870" and "Nos Elections au Reichstag" (1874). 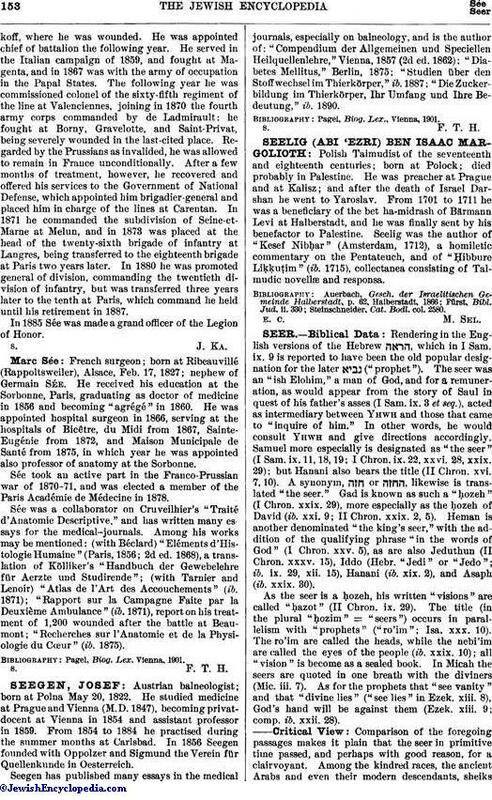 Sée made the first translation in French of Joseph ha-Kohen's "'Emeḳ ha-Baka," a history of the sufferings of the Jewish people from the time of their dispersion to the present day (Paris, 1881). Sée is an officer of public instruction. French general; born at Bergheim, Alsace, 1822; died in Paris March 17, 1904. In 1840 he entered the military school of Saint-Cyr, and in 1849 received his captain's commission and served in Algeria. Five years later he was ordered to the Crimea, and took part in the battles of Inkerman and Traktir as well as in the storming of Malakoff,where he was wounded. He was appointed chief of battalion the following year. He served in the Italian campaign of 1859, and fought at Magenta, and in 1867 was with the army of occupation in the Papal States. The following year he was commissioned colonel of the sixty-fifth regiment of the line at Valenciennes, joining in 1870 the fourth army corps commanded by de Ladmirault; he fought at Borny, Gravelotte, and Saint-Privat, being severely wounded in the last-cited place. Regarded by the Prussians as invalided, he was allowed to remain in France unconditionally. After a few months of treatment, however, he recovered and offered his services to the Government of National Defense, which appointed him brigadier-general and placed him in charge of the lines at Carentan. In 1871 he commanded the subdivision of Seine-et-Marne at Melun, and in 1873 was placed at the head of the twenty-sixth brigade of infantry at Langres, being transferred to the eighteenth brigade at Paris two years later. In 1880 he was promoted general of division, commanding the twentieth division of infantry, but was transferred three years later to the tenth at Paris, which command he held until his retirement in 1887. In 1885 Sée was made a grand officer of the Legion of Honor. French surgeon; born at Ribeauvillé (Rappoltsweiler), Alsace, Feb. 17, 1827; nephew of Germain Sée. He received his education at the Sorbonne, Paris, graduating as doctor of medicine in 1856 and becoming "agrégé" in 1860. He was appointed hospital surgeon in 1866, serving at the hospitals of Bicêtre, du Midi from 1867, Sainte-Eugénie from 1872, and Maison Municipale de Santé from 1875, in which year he was appointed also professor of anatomy at the Sorbonne. Sée took an active part in the Franco-Prussian war of 1870-71, and was elected a member of the Paris Académie de Médecine in 1878. Sée was a collaborator on Cruveilhier's "Traité d'Anatomic Descriptive," and has written many essays for the medical-journals. Among his works may be mentioned: (with Béclard) "Eléments d'Histologie Humaine" (Paris, 1856; 2d ed. 1868), a translation of Kölliker's "Handbuch der Gewebelehre für Aerzte und Studirende"; (With Tarnier and Lenoir) "Atlas de l'Art des Accouchements" (ib. 1871); "Rapport sur la Campagne Faite par la Deuxième Ambulance" (ib. 1871), report on his treatment of 1,200 wounded after the battle at Beaumont; "Recherches sur l'Anatomie et de la Physiologie du Cœur" (ib. 1875). Pagel, Biog. Lex. Vienna, 1901.